Revelstoke council adopts zoning and agrees to Master Development Agreement for major development in Arrow Heights. The major Mackenzie Village development is a go after council adopted the zoning for the property and approved the Master Development Agreement on Tuesday. David & Shelley Evans are planning to build a medium-density development that could include almost 1,200 units on a 35-acre property in Arrow Heights. The vote means they can move forward on the first phase of the development once engineers sign off on the plans and building permits are issued. David says they hope to break ground in the spring. “We have plans in good development for phase one and we’re intending to start on the consolidation of the property and the subsequent sub-division of phase one and be in place to get a building permit and development permit as soon as possible so we can break ground at the end of March, beginning of April,” he told the Review. The proposed development been controversial since it was first announced in February 2015. Opponents questioned its size and the impact on the Arrow Heights neighbourhood and the city’s infrastructure. Many others showed support, saying more housing is needed and it would spur economic development. Council supported the proposal from the start and gave it third reading after a contentious public hearing in March. Since then, Evans engaged the engineering firm WSP Canada to study the infrastructure needs and impacts of the development. With those, the city and developer crafted the Master Development Agreement, which governs how Mackenzie Village will be built out. The plan is to build the development in 12 phases and over 12 years, though the pace would depend on market demand. Each phase would require detailed design work and engineering to be completed before it could be started. Council approved the MDA unanimously. “I think getting 40–50 units in this community will be incredibly good for the housing crisis we have now and hopefully will alleviate that problem,” said councillor Connie Brothers. Phase one of the development would see 40-50 units constructed at the southwest corner of the property. 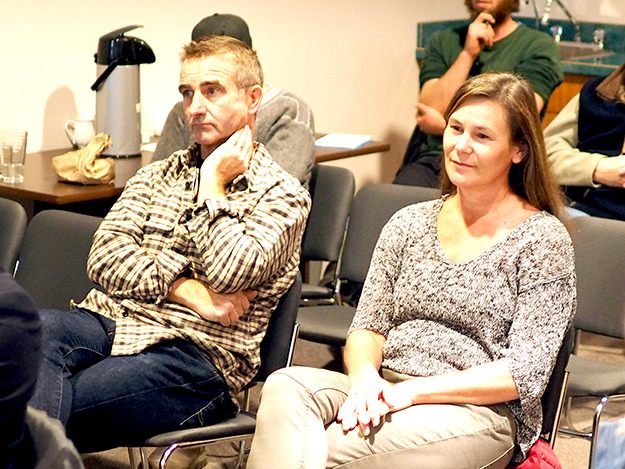 Photo: David and Shelley Evans listen while council discusses their Mackenzie Village development. Most of council’s discussion was centred around a report by Mike Thomas, the city’s director of engineering, on the infrastructure impacts of the development and the city’s ability to fund them. The report warns the city has up to $54 million in infrastructure needs over the next 15 years, but that the city’s current Development Cost Charges won’t cover that. He noted the pressures weren’t only the result of Mackenzie Village, but also from new hotels being built, possible development at Revelstoke Mountain Resort, and new home construction. With this in mind, council approved funding for two studies — $75,000 for a sewer treatment plant study and $80,000 for a review of the development cost charges bylaw. Coun. Linda Nixon said it shined a light on what the city needs to do going forward in the long-term. Coun. Aaron Orlando said the news Revelstoke has an infrastructure deficit shouldn’t come as a surprise to anyone. “If there’s one big picture issue that I have been frustrated with or concerned with in my time on council, it’s that we’re not moving forward more quickly on these engineering and planning studies,” he said. Mackenzie Village still needs to clear a few hurdles before it goes forward. The property still need to be consolidated, and then sub-divided into its different phases. The development permit and building permit for phase one also needs to be approved. However, the biggest hurdle – final adoption of the re-zoning bylaw – has been cleared and Evans said he expects to start marketing the development shortly.